KEEPER OF THE SNAILS: The Glass Menagerie by Tennessee Williams at Theatr Clwyd. 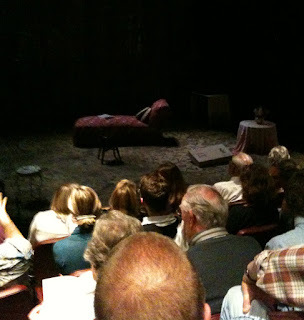 The Glass Menagerie by Tennessee Williams at Theatr Clwyd. Tom and Laura live with their mother in St Louis. The father is absent - not because he's died or even gone missing - but because he simply ran off (and sent a post card saying 'Hello and Good-bye' postmarked Mexico). This abandonment has become a sort of presence: the knowledge of it is always there, colouring everything with a dirty pallor. Maybe it is because he ran away that the mother still hankers after him, and nothing in her life has pleased her since. Her son clearly intends to abandon her too; while her daughter is preoccupied by her glass menagerie of animals and the phonograph her father left, which she plays endlessly. Laura has neither job nor husband, and her mother decides that what is needed is a 'gentleman caller', but the thought of this makes Laura ill. The play is based on the life of Tennessee Williams. Reading the programme I discovered that his sister, like Laura in the play, was subject to hysteria, and his real-life sister was eventually lobotomised because of it. Tennessee Williams too was plagued by depression, and attributed the success of his play to the genius of one of the first actors - who in turn was plagued by alcoholism. It is a play borne out of mental turmoil, then, and is suitably intense - a courting scene leads quickly into another rancorous scene between mother and son with the hapless Laura caught in between - and there is a constant unhappy tension. I enjoyed all of it, but it was the narrator's speech at the end which impressed me the most. He talks about seeing glass in a shop window. By then he has followed his father and run away from his controlling mother and 'crippled' sister. He imagines he's free of them but then he comes upon glass - twinkling and glowing in the lights of the window. It is then that he feels his sister's tap on his shoulder, and as he turns he realises he has not truly escaped, and that he never shall. His sister's menagerie, maybe symbolising all the experiences that form us, will always be with him - just as the memory of this play, perhaps more than many I have seen, will always be with me too. 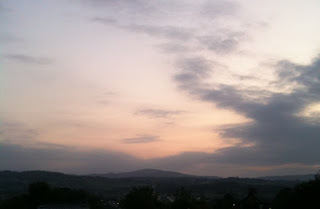 (View of Clwydian hills from Theatr Clwyd). Glad you enjoyed it. I've seen two recent productions, one with Jessica Lange; and another with Brenda Blethyn. Both productions were quite remarkable, though in completely different ways. Thanks John - excellent reviews! Brought something new to my experience of the play. I love 'The Glass Menagerie' - it is my favourite play. I once managed to tape a tv production with a young John Malkovich as Tom. I rarely watch it as I'm afraid of wearing the tape out. I've never been able to track it down on DVD. I always spot something new when I re-read it, it has so many emotional layers. I love the bit where the unicorn loses it's horn, so it becomes like the other horses. That sounds like an excellent tape, jem! I'll keep an eye open for it. I expect it will be shown again some time if the original tape still exists. And yes, I loved that bit too - quite a metaphor for herself, really. I haven't seen the Malkovich production, but Kate Hepburn starred in a production that aired in 1973 and is available on DVD at Amazon in the US. Tennessee Williams was fairly talented, eh?